Posted in Climate change, Energy, Politics on March 25, 2019 by wryheat2. This post was first published in the Arizona Daily Independent where it received more than 100 comments. Posted in Politics and tagged border, drugs, illegal on March 5, 2019 by wryheat2. Some simple questions for you Ed: Where will we get all the materials needed to construct the solar panels and wind turbines? Might they have to be mined? Might the metals and other materials used to build the equipment to manufacture the solar panels and wind turbines have to be mined? Might the copper for distribution lines have to be mined? By the way, electric cars use five times more copper than traditional fossil-fuel powered cars. Posted in Climate change, Energy, Politics and tagged green new deal on February 12, 2019 by wryheat2. The Green New Deal is not just about energy, it contains most of the old (and failed) socialist utopian policies such as free education through college, guaranteed jobs, free medical care. Read the list as complied by the Green Party. The Green New Deal would dramatically reshape the U.S. economy and add tens of trillions of dollars to the national debt. The radical plan would force families to pay more to heat, cool and provide electricity to their homes. It would raise the same costs for businesses, farmers, government and organizations, driving up their operating costs – and raising the prices for just about all the good and services Americans buy. Under the Green New Deal, Americans would have to power their homes with renewable energy, such as wind and solar power. Every home and business in the United States would have to be “upgraded” for “state-of-the-art energy efficiency, comfort and safety.” And a slew of massive government social programs and mandates would be created. In addition to the energy provisions of the Green New Deal that have received the most attention from left-wing pundits and radical environmentalists, there is a lot of important information related to this proposal that proponents have deliberately kept out of the spotlight. Here are five of the most important things you need to know about the Green New Deal. 1. It includes many radical programs that have nothing to do with so-called “green” energy. 2. It would do nothing to curb global warming. 3. Renewable energy costs significantly more than fossil fuels. 4. The Green New Deal would empower and give handouts to left-wing special interest groups and industries. Thousands of homeowners face rip-off energy bills for decades after being ‘scammed’ into joining a state-backed £400million eco-energy scheme that ‘utterly failed’. But more than three years after its collapse, families remain trapped repaying loans of up to £21,000 which they unwittingly took out for solar panels, replacement boilers and insulation. The repayments are added to monthly utility bills which in some cases have quadrupled once the loans were added to the cost of their usual fuel and will take more than 20 years to pay back. The Green New Deal proposes a massive expansion in the use of renewable energy technologies that rely on critical minerals we are not allowed to mine in the United States. FACTS: Green renewable energy requires literally tons of minerals that currently are unavailable in the quantities required for this transition. Of course, the GND includes no plan for additional mining to supply this broad initiative. FACTS: The Green New Deal’s website also says one of its goals is ending wars, which will supposedly “become obsolete” when fossil fuels are no longer used. If the advocates of the GND wish to limit the threat of war, then the United States needs to become mineral-independent in the same fashion it is now energy-independent. Posted in Climate change, Energy, Politics and tagged green new deal on January 29, 2019 by wryheat2. For any American who is tired of a faceless bureaucrat controlling your life, the United States Supreme Court gave you an early Christmas present when they announced that they will hear a case that could drastically scale back the power of federal agencies. The case deals with Mr. Kisor, a Marine veteran, who sought disability benefits for his service-related post-traumatic stress disorder (PTSD). Although this case is a compelling story of a Marine veteran trying to receive benefits he was entitled to, this case has far reaching implications that affect every American, especially businesses and property owners. The reason this case is so important is that it is an opportunity for the Supreme Court to eliminate Auer Deference. Auer Deference is a rule the Supreme Court made in the 90s that federal agencies use to create a cocoon of unlimited and unsupervised power for themselves. These agencies can then use that power to control the lives of every American without any real oversight from the court systems or elected officials. Auer Deference essentially requires a court to enforce an agency’s interpretation of its own rules, unless that interpretation is “plainly erroneous.” To understand how Auer Deference works it is important to understand how regulations are made. Essentially regulations are made when Congress decides in a law that they want an agency to be in charge of a certain issue. For example, Congress in the 70s knew that it wanted to take steps to protect the environment, but it did not want the political ramifications of sometimes choosing to protect the environment by harming landowners and businesses. So instead of passing laws that clearly laid out how it wanted to protect the environment, Congress passed laws like the Clean Air Act, the Endangered Species Act, and the Clean Water Act, that were intentionally vague, and gave agencies like the EPA, the US Fish and Wildlife Service, and the US Forest Service the power to interpret and create regulations to protect the environment. When Congress gives an agency the power to regulate something, they then have the authority to draft regulations laying out the rules and standards for the particular issue. Auer Deference incentivizes those agencies to draft obscure regulations which they will then be able to interpret. Then, if someone challenges the agency’s interpretation of a regulation, the court will automatically rule in the agency’s favor, unless the person can prove that the rule is “plainly erroneous.” Having to prove that a rule is “plainly erroneous” is nearly impossible. So an agency could create an absurd interpretation of a regulation it intentionally left vague, and there would be no recourse or protection against the agency enforcing that interpretation. Essentially, Auer Deference allows the people writing the rules to also interpret the rule (or in other words, the patients are running the rulemaking asylum). Although there are numerous examples of how Auer Deference harms the rights of Americans daily, a practical example of an agency using Auer Deference can be found in the Endangered Species Act. When deciding what areas should be designated as critical habitat, the US Fish and Wildlife Service created a regulation stating, “the Secretary shall focus on the principal biological or physical constituent elements within the defined area that are essential to the conservation of the species.” The regulations however do not define “essential to the conservation of the species.” Due to the ambiguity as to what is actually “essential to the conservation of the species,” the Fish and Wildlife Service has used the ambiguity to unilaterally designate critical habitat wherever they want, even stating that critical habitat did not have to actually be habitable by the endangered species. The Fish and Wildlife Service’s liberal use of “critical habitat” was the primary issue in the Dusky Gopher Frog case. In that case the agency interpreted its own rules as to what can be designated as critical habitat and determined that certain land in Louisiana, that the dusky gopher frog could not viably live on, was listed as critical habitat for the species. Since the Fish and Wildlife Service were the “experts” the district court and the Fifth Circuit both used Auer Deference to rule in favor of the Fish and Wildlife Service that critical habitat did not have to be habitable. Although the Supreme Court luckily reversed the Fifth Circuit and ruled that critical habitat had to actually be habitable, the decision was sent back to the Fifth Circuit. Due to Auer Deference, the Fifth Circuit could conceivably rule in favor the Fish and Wildlife Service and designate uninhabitable land as critical habitat. In the end, Justice Scalia best described the problem with Auer Deference when he wrote, “Auer deference… contravenes one of the great rules of separation of powers: He who writes a law must not adjudge its violation.” Or in other words, the greatest harm that Auer Deference creates is that it gives the power of interpreting the law to the very same people who write the law. Such power naturally can create corruption. This corruption manifests in federal agencies creating intentionally vague regulations that nobody can follow in order to allow government bureaucrats to write the laws themselves on a case-by-case basis. Thankfully, it appears that the US Supreme Court recognizes the dangers of Auer Deference and will hopefully eliminate it. Posted in Politics and tagged Auer Deference on January 26, 2019 by wryheat2. Proposition 127 is very bad policy because: 1) wind and solar generation of electricity are both expensive and unreliable; 2) wind and solar generation can be dangerous to wildlife, human health, and the environment; and 3) the perceived need for more wind and solar generation is based on the false assumption that carbon dioxide emissions are a major cause of global warming. The method of generating electricity should not be determined by one-size-fits-all government mandates, but rather by local market conditions and resources. In the following summary I explain the problems with renewable energy. More background is available in the references at the end of this post. Arizona currently produces half of its renewable energy from hydropower generated at the large dams on the Colorado River, but, according to the proposed amendment, this electricity is not to be counted toward the 50% mandated goal. According to the Energy Information Administration, power plants in Arizona generate more electricity than the state consumes, and Arizona generating stations supply electricity to consumers throughout the southwest. Electricity produced by wind and solar turns out to be much more expensive than electricity produced from coal and natural gas. That is mainly because wind and solar are unreliable, they can’t respond to demand. Therefore they need nuclear or fossil fuel generated electricity as backup which causes the fossil fuel plants to run inefficiently which is more expensive (and produces more carbon dioxide). Europe has been a world leader in using wind and solar energy. The price, however, is high. 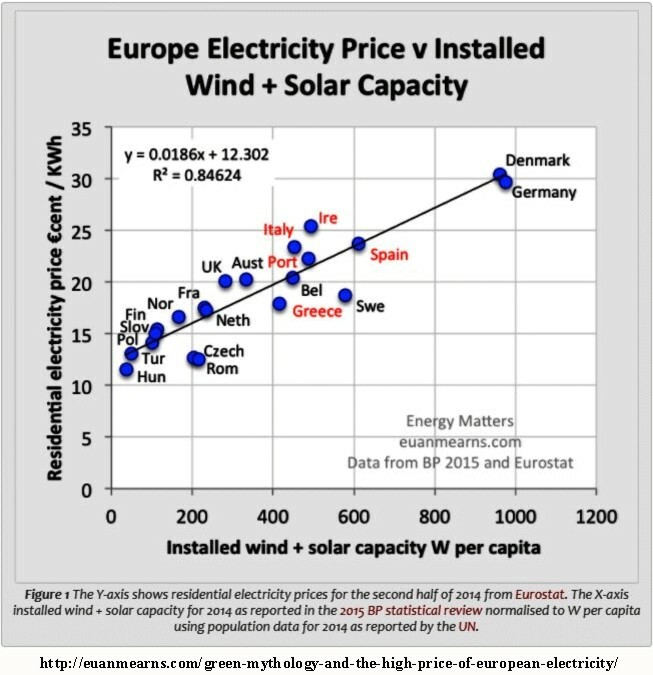 Real operational data show that the more installed solar and wind capacity per capita a country has, the higher the price people pay for electricity. (Source) In some European countries electricity prices are triple the average cost in the U.S. Ironically, carbon dioxide emissions in those countries are rising while in the U.S. emissions are decreasing. Also ironically, according to the New York Times, renewables are helping to push nuclear power, the main source of zero-emissions electricity in the United States, into bankruptcy. Between 2011 and 2017, California’s electricity prices rose five times faster than they did nationally. Today, Californians pay 60 percent more, on average, than the rest of the nation, for residential, commercial, and industrial electricity. California’s high penetration of intermittent renewables such as solar and wind are likely a key factor in higher prices. (Link) Had California spent an estimated $100 billion on nuclear instead of on wind and solar, it would already have had enough energy to replace all fossil fuels in its in-state electricity mix according to a new analysis by Environmental Progress. A study by the left-of-center Brookings Institution found replacing conventional power with wind power raises electricity prices 50 percent, and replacing conventional power with solar power triples electricity costs. Costs are much higher for three reasons. First, the cost per MW [megawatt] of capacity to build a wind or solar plant is quite high (and much greater than that of a gas-fired plant). The cost per MW of solar capacity is especially high. Reductions in the cost of solar-voltaic panels have reduced the cost of building a solar plant by 22 percent between 2010 and 2012, but further reductions are likely to have a lesser effect because the cost of solar panels is only a fraction of the total cost of a utility-scale solar plant. Second, a wind or solar plant operates at full capacity only a fraction of the time, when the wind is blowing or the sun is shining. For example, a typical solar plant in the United States operates at only about 15 percent of full capacity and a wind plant only about 25 percent of full capacity, while a coal plant can operate 90 percent of full capacity on a year-round basis. Third, the output of wind and solar plants is highly variable—year by year, month by month, day by day and hour by hour—compared to a coal-fired plant… Thus more than six solar plants and four wind plants are required to produce the same output with the same degree of reliability as a coal-fired plant of the same capacity. Utility scale wind and solar installations require vast expanses of land that affect local habitats. Wind turbines chop up birds and bats, including endangered species. Solar installations burn up birds and other flying animals. Low frequency sound from wind turbines causes a variety of human ailments. The manufacturing and disposal of solar panels put dangerous chemicals into the environment. For example, many PV solar panels rely on polysilicon being manufactured in large quantities and at high quality. A byproduct of polysilicon production is silicon tetrachloride, a highly toxic substance that poses a major environmental hazard. Wherever silicon tetrachloride is dumped, the land becomes totally infertile. A major environmental cost of photovoltaic solar energy is toxic chemical pollution (arsenic, gallium, and cadmium) and energy consumption associated with the large-scale manufacture of photovoltaic panels. Does that sound like “clean energy”? A recent study shows that solar modules cause more greenhouse gas emissions than modern coal power plants. It turns out that because of the emissions of extraordinarily potent greenhouse gases nitrogen trifluoride and sulfur hexafluoride and energy requirements of manufacturing solar modules, solar energy ends up being worse for the climate than burning coal. Another danger is that proposition 127 is intended to be an amendment to the Arizona Constitution rather than a statute. It will therefore be much harder to repeal once its utter folly is realized. The push for renewable energy, especially wind and solar generation, is based on the contention that carbon dioxide emissions from burning fossil fuels are a significant cause of global warming. A report from the Science and Public Policy Institute estimates the temperature savings theoretically obtained by stopping all carbon dioxide emissions for each state and for the U.S. as a whole. 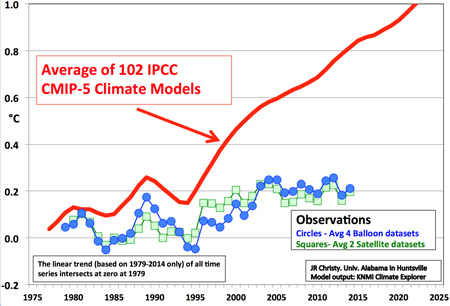 According to SPPI, if Arizona stopped all carbon dioxide emissions, it would theoretically prevent a temperature rise of 0.0014°C by 2050 and 0.0029°C by 2100. If the U.S. stopped all carbon dioxide emissions, it would theoretically prevent a temperature rise of 0.172°C by 2100. (Link to report) Do you think that’s worth the higher electricity prices and disruption of the electric grid? In the entire geological history of the planet, there has been no known linkage between CO2 and temperatures other than that temperature controls the solubility of CO2 in the oceans. (See reference 8) The war on carbon dioxide tries to cure a problem that does not exist. Generating more electricity from solar and wind is just a very expensive exercise in political correctness that will have little impact on carbon dioxide emissions, but a big impact on your wallet, and an adverse impact on electric grid stability and the environment. (See reference 7) If you really want low/no emissions generation of electricity, we should invest in more nuclear generation which is always there when you need it. Note: This article is based upon my own observations and research. I have had no dealings with any of the several PACs organized for or against the proposition. This article may be reprinted provided credit is given to the author and link back to the original. 9. What keeps Earth warm – the greenhouse effect or something else? Posted in Climate change, Energy, Politics and tagged 127, renewable energy, solar, wind on September 25, 2018 by wryheat2. Arizona currently produces half of its renewable energy from hydropower created by the large dams on the Colorado River, but, according to the proposed amendment, this electricity is not counted in the 50% mandate. According to the Energy Information Administration, power plants in Arizona generate more electricity than the state consumes, and Arizona generating stations supply electricity to consumers throughout the southwest. In my opinion, this amendment is very bad policy. It is stupid, dangerous, and expensive. In the following summary I explain. More background is available in the references at the end of this post. Electricity produce by wind and solar turns out to be much more expensive than electricity produced from coal and natural gas. That is mainly because wind and solar are unreliable, they can’t respond to demand. Therefore they need nuclear or fossil fuel generated electricity as backup which causes the fossil fuel plants to run inefficiently which produces more carbon dioxide. Generating more electricity from solar and wind is just a very expensive exercise in political correctness that will have little impact on carbon dioxide emissions, but a big impact on your wallet and an adverse impact on electric grid stability and the environment. Posted in Climate change, Energy, Politics and tagged mandate, prop 127, renewable energy on August 23, 2018 by wryheat2. The original intent of this clause was that the federal government can buy private property if it was needed to build something like a fort in time of war. However, over the years this “taking clause” (aka “public use clause”) has morphed into licence for states and local governments to take private property for any reason they see fit. This was, in my opinion supremely wrong (see my 2005 essay below). The U.S. House of Representatives has made several tries to make things right, but the U.S. Senate never followed through. The most recent try was in July, 2018, when the House unanimously passed the Private Property Rights Protection Act (see summary and full text). We should write to our senators (and senatorial candidates) urging them to take up this legislation when they return from August recess. The United States Supreme Court, by its recent decision in Kelo vs. The City of New London, has just put your house up for sale, and your business, and your church. In the past “public use” has meant things like highways, reservoirs, or other public works. But now, according to the “Kelo” decision, “public use” can mean anything a local government says it means. The Kelo decision says that government, any government, has the right to condemn your private property and transfer titles to another private party simply to encourage economic development and a larger tax base. Increasingly, the cost of perceived societal goals are not borne by society as a whole, but by individual property owners. This has long been the case under the Endangered Species Act and increasingly so under the principle of Eminent Domain. The “Kelo” decision is supremely and fundamentally wrong because it subjects us to the tyranny of the majority, or the whim of a city council, rather than protect our individual rights as guaranteed by our republican form of government. Posted in Politics and tagged eminent domain, property, taking on August 7, 2018 by wryheat2. 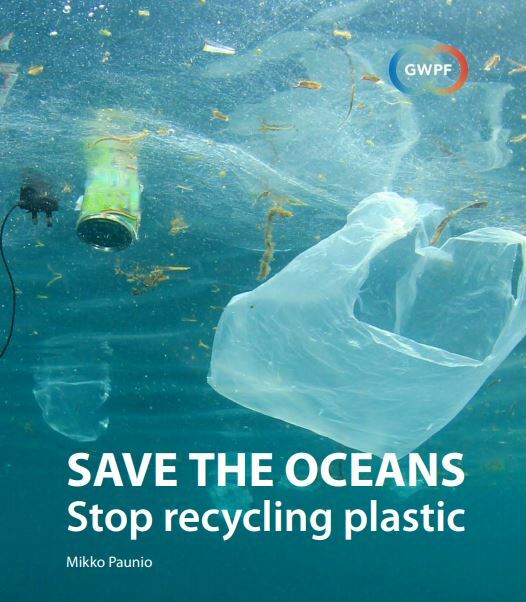 Plastic in the oceans has been deemed an environmental problem and a danger to wildlife. Where does this plastic come from? According to a new report from the Global Warming Policy Foundation, much of the plastic comes from “leakage” from recycling operations. Some of that “leakage” is deliberate dumping in oceans and rivers by shippers in order to avoid fees. The report is just ten pages, but it cites 50 scientific studies and articles. 75% of land based marine litter in low to upper-middle income economies comes from litter and uncollected waste, while the remaining 25% of the land-based sources is plastic which leaks from within the waste management system. In other words, the ISWA report shows that 25% of the leakage is attributable to the waste management option preferred by green ideologues; meanwhile, waste incineration can prevent any leakage of plastic if municipal solid waste (MSW) is incinerated along with sewage sludge. Despite this, incineration is vehemently opposed by green ideologues and also by the EU, which chooses to believe in the mirage of a circular economy. The vast majority of the marine litter problem is attributable to poor waste collection and other sanitary practices in Asian, and to a lesser extent African, towns and cities in coastal areas and along rivers. The problem is particularly acute in China. The neglect of urban sanitary policy – the backbone of development agendas until that time – started when the ‘mother of sustainability’, Norway’s Prime Minister Gro Harlem Brundtland, personally refused to have it be part of her World Commission’s work program and ultimately its 1987 report, which famously led to the adoption of ‘sustainable development’ goals by the UN General Assembly. This report describes the absurdities, inefficiencies, double or even triple waste management structures and horrible consequences of the EU’s erratic green waste policy, its fact-free claim that its waste policy helps to implement the Paris climate agreement, and its dumping of 3 Mt of plastic in China each year, with horrific consequences for the marine environment and health. The EU has now started to sideline – in the name of circular economy – the highly successful waste incineration policy implemented in seven EU member states – Austria, Belgium, Denmark, Finland, Germany, the Netherlands and Sweden – which all have major waste incineration capacity and now landfill less than 3% of their MSW. The study notes the best thing to do is bury plastic in landfills or burn it. However, these methods don’t fit into the environmentalist’s scheme of sustainable development. Burning plastic along with other material has very few undesirable emissions. The resulting ash can be sent to landfills or used for applications such as road-building materials. Recycling plastic poses some problems. First much plastic has to be washed which uses large amounts of water. Plastic also has to be sorted from other waste and by type of plastic because recycling processes are different for different types of plastic. Save time, water, energy, and expense by burning or burying plastic. Don’t recycle it. The solution is to have more-careful waste collection and management. Posted in Climate change, Energy, General Science, Politics and tagged plastic, save the oceans on July 10, 2018 by wryheat2.